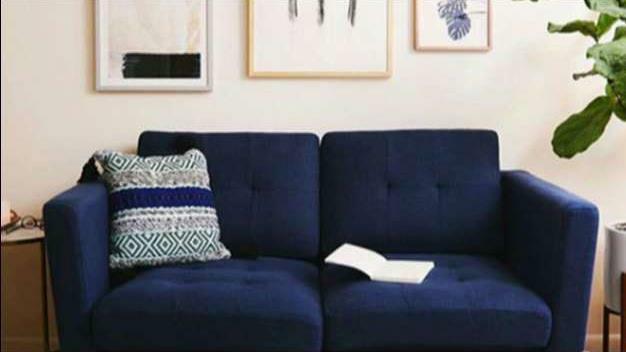 Burrow Co-CEO Stephen Kuhl on the couch company's unique business model and the decision to manufacture in the U.S.
Two college students brought their wits to the furniture industry to reinvent the shopping experience. Burrow, the company founded by Stephen Kuhl and Kabeer Chopra, is a “couch-in-a-box” company that promises to deliver comfortable, well-made furniture at a fraction of the cost. In May, Kuhl moved his business from Mexico to Mississippi after manufacturers realized it was a valuable business. The collection features custom products including ottomans (starting at $295), armchairs ($495) and king sofas ($1545) with a choice of fabrics, legs, arm heights and lengths. The furniture arrives within a week and includes free shipping. The sofas are packed in regular-sized shipping boxes, unfold, and require little time and no tools for assembly. Customers have 30 days to try out their products before returning. The direct-to-consumer startup is also opening up its first flagship store in New York City where customers will have the opportunity to kick back, relax and hang out in a living room environment.